How to customize the default style of Schedule elements in WindowsPhone WinRT? SfSchedule allows you to customize by overriding the default styles. The following section explains the customization of some basic elements in Schedule. 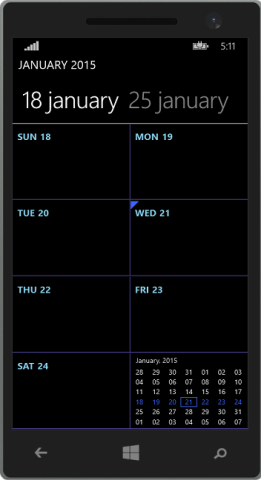 Create a Windows Phone WinRT application and add SfSchedule control as follows. Apply the default style customization of Schedule elements as follows. In order to customize the foreground color of AllDay in Day view, you need to override the default style of ScheduleDaysView control and add the necessary style in the application as follows. To customize the WeekViewItems foreground and border, you need to override the default style of WeekViewItem control and add the necessary style in the application as follows. Similar to customizing the foreground color of the Month calendar text in Week View, you need to override the default style of WeekViewMonthCalendar control and add the necessary style in the application as follows. The following example illustrates the default style customization of week view items foreground and Border in Schedule week view. In the above example you can customize the AllDay text, directly, by applying the styles given above for customizing AllDay text and by changing the schedule type to Day View respectively. The output for AllDay Customization is as follows.